"While Backhaus's understanding of Beethoven is not, at this time of day, in any dispute, there is room to question whether these particular performances succeed in conveying it to the listener. They are dominated by a savage attack, and a refusal to play below an mp-mf degree of volume; a refusal that may be the result of many years' experience of recording under less satisfactory technical conditions than to-day's—which are here not on their very best behaviour, but are nevertheless good, and of course greatly superior to those that may be in Backhaus's mind .. The Appassionata stands up to the strain fairly well ; and is, indeed, particularly in the last movement, an impressive display of technical powers of the most advanced kind." "The classical, precise, authoritative Backhaus is presented here with uncommonly lifelike quality. He has his minor erraticisms, but they are no more than a part of the person who is presenting a great master for our full attention. Backhaus's own intense conviction of the composer's mastery fully overcomes any doubts one might have about the music. In truth, not one of these three sonatas is of great magnitude—that in G major (op. 79), Beethoven himself entitled " sonate facile ou sonatine."... I like the brittle, guitarry effect Backhaus creates for the opening movement of Op. 79: it has a kind of peasant air about it. The andante is taken well under walking pace, and I could bear the vivace finale more headlong. From this disc I had slight trouble with blast, which remained even if one turned the dynamics down. Backhaus's percussive style need not lead to this fault." 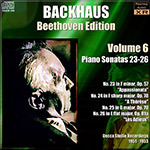 I have pointed out in previous technical notes that it has increasingly become my opinion that this series of Beethoven sonata recordings is one neglected - and, in its day, often disparaged - not primarily as a result of the playing by Backhaus of these works, but the by the raw deal he was served up by Decca's inadequate recordings. In this volume pitch is, for the most part, not the issue seen previously, the exception being the first movement of the Appassionata, which dips alarmingly to begin with before proceeding to waver and jump about throughout the movement, most probably the result of editing together various takes as much as poor general tape speed stability. This has, for the first time, been corrected. I would have to take issue with The Gramophone reviewer's suggestion that Backhaus refuses to play below mp-mf throughout the work - but can well imagine that impression being given by poor reproduction of his playing. Much of this is now happily alleviated here, and these interpretations can be more clearly judged within the excellent sonata cycle they so clearly combine to produce. BEETHOVEN Piano Sonata No. 23 in F minor, Op. 57 "Appassionata"
BEETHOVEN Piano Sonata No. 24 in F sharp major, Op. 78 "A Thérèse"
BEETHOVEN Piano Sonata No. 26 in E flat major, Op. 81a "Les Adieux"
Wilhelm Backhaus (1884–1969) recorded two Beethoven sonata cycles for Decca. These are the fifth and sixth volumes in Pristine Audio’s reissue of the first, lesser-known cycle, which was recorded in mono between 1950 and 1954. Engineer Andrew Rose suggests that the second cycle, from later in the 1950s through the ’60s, was done for reasons other than the obvious change to stereo. He describes Decca’s first production team in Geneva as “struggling badly with new technology” and has worked to correct peak distortion, wayward electrical tones, high background hiss, poor overall tone, and most egregiously, extreme changes in pitch. The result is perfectly listenable sound. Backhaus’s basic sonority is full and rather bright, slightly piercing in the high treble, perhaps due to the Bösendorfer that he played. There’s still an impression of very close miking or recording at overly high levels. Rose takes issue with the Gramophone critic who, in the ’50s, complained that Backhaus “refuses” to play quieter than at a medium dynamic level, but even with Pristine’s admirably reworked sound, I perceive the same thing. The fact that in a few spots, such as at the opening of the last movement of No. 18 (op. 31/3), and in parts of the “Appassionata’s” first movement, we hear moments of truly quiet playing confirms it. It’s a significant drawback in what I find to be an uneven series of performances that, all the same, have a few superb highlights. No. 18: Compared to the first two, more experimental sonatas in Beethoven’s op. 31, the third is more like a suite or divertimento. Three of its four movements stay, more or less, in one character. Backhaus understands the work’s comic spirit, and gives well-controlled, happy, but generally too loud performances of the second and fourth movements. The sonata’s most interesting feature is the way in which Beethoven integrates slower lyrical material—heard at the opening, where it has the effect of being an introduction—into the cheerful Allegro first movement. Backhaus responds with sensitivity to the pleading three-note motive, though he pedals through the important rests that follow it. Nos. 19 and 20: Subtly paced phrasing and beautiful singing tone—Backhaus scales back his characteristically sturdy sound—make these model performances. His casual pedaling through a few rests is a small price to pay for such fresh, unassuming readings of these two sonatinas. No. 21: Successful performances of the “Waldstein” require, in the first movement, precise, energetic playing contrasted with smooth legato in the second theme’s angelic chordal melody. The Introduzione can operate at one of the slowest tempos anywhere in Beethoven, and the finale, employing long pedals at the opening, should be simple, quiet, and sublime in its main material, exciting in the episodes, and thrilling in the coda. Backhaus’s looser approach doesn’t really meet most of these requirements, but causes me to rethink them, somewhat. The first movement’s second theme is played downright perversely; it’s loud, percussive, and lacking in line. There’s quite a bit of tempo fluctuation throughout the first movement, and even more in the Introduzione. The finale is conceived along the right lines, though there’s no true pianissimo. Backhaus offers clarity, the long pedals are observed, and there’s virtuosic abandon in the faster episodes. He humbly slows down to play the famous glissando octaves as separate strokes. No. 22: This underappreciated, experimental sonata owes much to Haydn in its construction and humor. In the first movement, a minuet parody with two variations is interrupted by unruly outbursts of octaves and parallel sixths. (I have always thought of the minuet sections as representing Haydn, and the subversive interruptions representing his student, Beethoven.) Backhaus notches up the tempo in the octave sections, heightening the contrast with the main material, but the movement holds together better if they are united with the minuet in pulse if not in spirit. Like most pianists, Backhaus plays the difficult second movement faster than I think it should go—it’s a moto perpetuo marked Allegretto that should only give way to a faster tempo in its coda—yielding to the temptation of turning it into a showy toccata. In his performance there’s no tempo increase at the end. There’s more wit and subtlety, even a kind of mystical stillness at the heart of its constant motion than Backhaus provides, but he certainly plays it with great energy and fine fingerwork. No. 23: The “Appassionata”s first movement receives a taut, impassioned reading with carefully gauged dynamics. (Backhaus didn’t get around to remaking either the “Appassionata” or the “Hammerklavier” for his second cycle.) The playing is splendid from a technical point of view, steadier and more disciplined than usual, as if Backhaus had borrowed Rudolf Serkin’s metronome. In the finale, Beethoven, in an unusual sonata form that he developed in the finale of op. 54, very clearly asks for the lengthier, second part of the movement to be repeated before arriving at the coda. I’m confounded as to why so many pianists, Backhaus included, don’t take this repeat. The design of the entire sonata is compromised and trivialized by abbreviating this movement. Backhaus is also inclined to play this movement loudly, even though so much material in it is meant to be quiet. He anticipates the final presto by accelerating way too soon before it is indicated. Op. 78: After allowing the opening four measures to unfold expansively, Backhaus rattles off the first movement in a way that robs it of some of the lyricism that the opening phrase invokes. His slightly measured tempo in the second movement is a pleasant surprise. Op. 79: The first movement could benefit from a simpler steadiness. The second movement, which uncannily anticipates Mendelssohn’s Venetian boat songs, plods along at too slow a tempo, but Backhaus finds a witty, throwaway quality for the finale that’s just right. Op. 81a: Here is a thoughtfully planned, fully engaged performance that communicates the yearning and nostalgia in the first two movements and the last movement’s joyous excitement. This “Les Adieux,” like his “Emperor” Concerto with Clemens Krauss (also issued on Pristine and reviewed elsewhere), confirms Backhaus’s reputation as one of the great Beethoven interpreters. Despite my feeling that many of Backhaus’s Beethoven sonatas aren’t characterized with enough detail, his playing always seems sincere and alive, unegotistical, with a human quality. Schnabel’s pioneering EMI cycle from the 1930s delineates Beethoven’s dynamics and goes deeper interpretively. It has been issued on Pristine with splendidly improved sound. Nonetheless, it’s good to have Backhaus’s unfussy second opinion.